This product is curently out of stock, why not add this to your wishlist? European Fan Palm - Chamaerops Humilis This is a multi stemmed, shrub-like, clumping palm (multiple trunks). The European Fan grows slowly to 2-5 metres tall and no two humilis look the same. 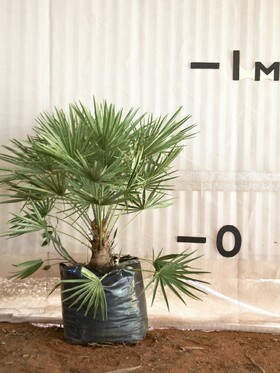 It's the northern-most naturally growing palm in the world. Its native to the Mediterranean growing on dry hill slopes and therefore likes cool moist winters and dry summers. 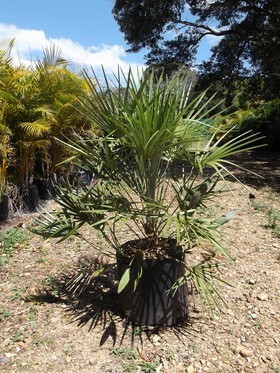 It is extremely cold tolerant and will withstand frosts to -12 degrees c. This palm is slow growing, likes full sun and must be well drained. The dead fronds need to be removed for the best appearance, as it's not self-cleaning. The clumps will eventually grow 2 metres wide with small serrations on the stems and fronds inside the clump, but there are no spikes and not dangerous. The European Fan has said to have a cactus like appearance; also both male and female flowers are on separate plants. These palms are great for Melbourne, Canberra and Western Sydney.